Both want the gay vote, but voters must decide who advocates best for LGBT issues. While we did think it important to analyze the debate surrounding Anthony Weiner’s “gay” pants, that shouldn’t distract us from the fact that he’s running for a pretty important position. You know, Mayor of New York City—and that entails a teensy bit more than making savvy wardrobe decisions. Weiner, seen at New York City Gay Pride using a megaphone to shout his last name, tongue-in-cheek, is in an even more unique position because no amount of self-mockery can change the fact that his formidable opponent is an out lesbian, Christine Quinn. During his tenure in the House, he consistently voted to promote civil rights issues across gender, race, and sexual orientation lines. Look here for a breakdown of his civil rights votes and here for a full view of his record in the House. The HRC rated him at 100% in 2006, indicating that he's extremely pro-gay rights. Has experience taking Grindr-esque pictures on his phone. Is an out, proud lesbian and has experience being the first gay person to hold a specific position (specifically, the first woman and openly gay City Council Speaker. Both would also be firsts if she becomes mayor). She served as the Executive Director of the NYC Anti-Violence Project, whose mission statement is: "AVP empowers lesbian, gay, bisexual, transgender, queers, and HIV-affected communities and allies to end all forms of violence through organizing and education, and supports survivors through counseling and advocacy." Has boycotted the St. Patrick's Day parade since 2006 because The Ancient Order of the Hibernians, a parade sponsor, won't allow gays to march openly. Makes sense since she is a lesbian. In 2012, after Chick-Fil-A's CEO voiced his opinion against marriage equality, she sent a letter to NYU requesting the university end its relationship with the company. Weiner is not gay, and therefore not under pressure to be a spokesperson or overtly fierce supporter of every gay cause. As a straight white male, he benefits from his voting record but he remains rather distant from the gay community, meaning most people won't feel "betrayed" (which some Quinn detractors have expressed feeling) when he doesn't go out on a super-leftist limb for gay issues. (Not he is actually kind of super leftist). 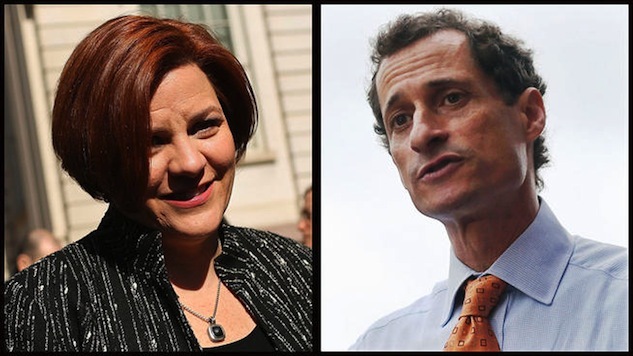 Weiner served on the NYC Council until 1999, meaning he hasn't had as much recent interaction or subsequent potential for criticism over NYC-specific gay issues as Quinn has had. She has been criticized for "going mainstream" and abandoning certain gay issues/her post as the gay representative at the political table. In 2008 Quinn opposed a Council bill that would have extended housing to HIV-positive New Yorkers without AIDS. She argued that it would "drain city resources and raise issues about supporting the poor with other illnesses." In 2009 she did not endorse any of the three openly gay candidates for City Council. Several anti-Quinn groups have emerged. A sampling: Queers Against Christine Quinn, Defeat Christine Quinn, Stop Christine Quinn, and Christine Quinn Sold Out. Weiner has only released one tangible guide to his plan for the city, called "Keys to the City," and it doesn't focus all that much on gay issues. Searches for "gay," "lesbian," "lgbt," and "hate crime" only yield his insistence that gay men be permitted to donate blood. So while he hasn't laid out explicit LGBT plans (which would be helpful for voters), we maybe can assume from his history and opinion on blood donation that he would have some good ideas. Still, it would be a lot more reassuring if he demonstrated some forethought. There are issues that need to be tackled as soon as the new mayor takes office. Wants to include categories for sexual orientation in city surveys and data collection because LGBT residents "may have very distinct health and other needs." Plans to work with the NYPD to target and better police "high-target" hate crime areas.